Q. 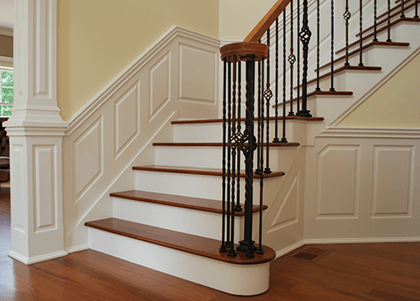 Will my Wainscoting be shipped in one piece? A. Depending on the configuration and number of inner panels it may be required to fabricate the panels in two or three sections. If more than one section is required the joint(s) will be located in the center of a middle stile. We will biscuit cut the joint(s) and provide biscuits with the order. Joint(s) should have glue applied to the biscuits before joining panels together on the wall. A thin layer of wood fill should then be applied over the joints and sanded smooth prior to priming. A. The system will calculate the shipping if you login to your account. If you don't have an account you can create an account for US and Canadian addresses quickly. Q. What is the standard lead time? A. Typically we will fabricate and ship your order within 5 business days. Occasionally orders will spike and the lead time will increase to 7+ days. Q. How long will my shipment take? A. We will ship your order standard freight from our Wolcott, Connecticut facility. Depending on your proximity to our business the shipping time will be 2 to 6 business days. A. The size and weight of the order will determine how it will ship. Small orders will ship either USPS or Fed Ex Ground. Large or heavy orders will mostly likely ship with XPO (Con-Way Freight) and are curb side delivery for residential addresses. Curb side delivery is where the freight carrier will pull the truck up to the curb and the customer will be required to move them from the curb to the house. The wainscoting panels will be boxed and on a pallet. The freight carrier will unstrap the pallet and hand the boxes to the customer. A. Yes, You can create an account for US and Canadian addresses. Please call to coordinate Canadian shipping arrangements (203) 879-1278. Q. What Lengths do moldings ship in? A. 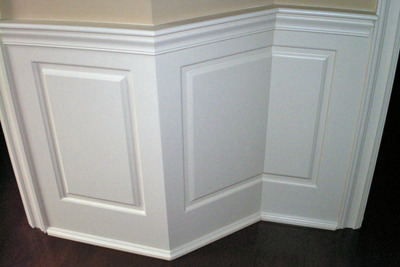 All our moldings ship in lengths up to 94". An 8FT molding is considered 94" long. This 94" limit is based on FedEx and Freight Surcharges of $100 for lengths 96" or greater.